LAS VEGAS, Jan. 5, 2018 /PRNewswire/ -- Consumer Electronics Show -- CEVA, Inc. (NASDAQ: CEVA), the leading licensor of signal processing platforms and artificial intelligence processors for smarter, connected devices, today unveiled NeuPro™, a powerful and specialized Artificial Intelligence (AI) processor family for deep learning inference at the edge. 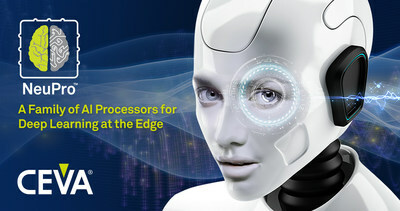 The NeuPro family of processors is designed for smart and connected edge device vendors looking for a streamlined way to quickly take advantage of the significant possibilities that deep neural network technologies offer. NeuPro builds on CEVA's industry-leading position and experience in deep neural networks for computer vision applications. Dozens of customers are already deploying the CEVA-XM4 and CEVA-XM6 vision platforms along with the CDNN neural network software framework in consumer, surveillance and ADAS products. This new family of dedicated AI processors offers a considerable step-up in performance, ranging from 2 Tera Ops Per Second (TOPS) for the entry-level processor to 12.5 TOPS for the most advanced configuration. Ilan Yona, vice president and general manager of the Vision Business Unit at CEVA, commented: "It's abundantly clear that AI applications are trending toward processing at the edge, rather than relying on services from the cloud. The computational power required along with the low power constraints for edge processing, calls for specialized processors rather than using CPUs, GPUs or DSPs. We designed the NeuPro processors to reduce the high barriers-to-entry into the AI space in terms of both architecture and software. Our customers now have an optimized and cost-effective standard AI platform that can be utilized for a multitude of AI-based workloads and applications." The NeuPro family, coupled with CDNN, CEVA's award winning neural network software framework, provides the ultimate deep learning solution for developers to easily and efficiently generate and port their proprietary neural networks to the processor. CDNN supports the full gamut of layer types and network topologies, enabling fastest time-to-market. For more information on the NeuPro family of processors, visit: https://www.ceva-dsp.com/product/ceva-neupro/.